On the west side of Chicago, sits one of the most fast-growing and impassioned neighborhoods in the city: Ukrainian Village. This is the place to wander for beautiful churches and cathedrals, laid back brunch spots, art galleries and museums, cultural centers and live music. Here is our list of the top things to do while exploring this robust, yet compact, village. Ukrainian Village, and the West Town area, has plenty of good eats to choose from. The variety of food in the area is representative of the diverse culture that exists here. Use this list to narrow down your search or, better yet, explore the area at length and take yourself on a gourmet safari, drinking and eating all along the way — just remember to wear your stretchy pants and walking shoes. All of these options are located in the Ukrainian Village District, with Division Street to the north, Chicago Avenue to the south, Western Avenue to the west and Ashland Avenue to the east. Fatso's Last Stand serves up homemade mac n’ cheese, burgers, fried shrimp and char dogs at all hours, with late nights extending to 4 a.m. on the weekends. Bite Cafe is light and bright, with a menu full of vegetarian and vegan options as well as hearty staples like burgers, ribeye and pork chops. Daily dinner specials make each night a fun night — Friday Fish Fry, anyone? Bite Cafe is owned by the neighboring Empty Bottle music venue. Tryzub Ukrainian Kitchen serves up traditional Ukrainian fare in an art-filled colorful space. You can order take-away items through the quick-service coffee window, like handmade Ukrainian-style pierogies, potato pancakes, goulash and belly-filling crepes. Arami is a contemporary sushi gem, in a light-filled red brick building. The menu is complete with small and large plates, sashimi, nigiri, maki and robata (Japanese charcoal grill). The miso soup is delicious. Dine-in, carry-out or sip a sake — or a Japanese beer — while figuring out your next move. Roots Handmade Pizza is, of course, a favorite for any Chicagoan — we love our red sauces and Roots makes theirs with a little kick. Plus, the crust is made with dark-roasted malt. Above Roots is Homestead on the Roof, a farm-to-table restaurant with an open-air patio for sipping handcrafted cocktails. Dine with a view of the gigantic 3,000 square-foot organic garden. Snuggle up by the brick fireplace and enjoy time well spent with friends or family. There’s also seating indoors, year-round, for private parties and a cozy happy hour. Whisk, a local favorite, is a colorful American restaurant with Mexican roots, owned and operated by brothers Rick and David Rodriguez. This pair of talented chefs serves up favorites like Breakfast Sopes, Chicken & Corn Cakes and house-made Veggie Burgers. The Ukrainian National Museum of Chicago, situated in the heart of this celebrated neighborhood, has nearly 10,000 objects on display as part of its folk art collection. Once you walk through the doors, you'll see: festive, formal and ritual clothing; embroidered and woven textiles; ceramics, metal and wood objects; an extensive collection of Ukrainian fine art — paintings, sculpture, drawings; and a huge collection of Ukrainian Easter eggs — pysanka. More than anything, though, this museum highlights the indelible mark that the Ukrainian culture and history has left on Chicago. The Empty Bottle, located on a neighborhood corner, is a popular indie venue for live alternative music and affordable drinks for adults, 21 years-old and up. Chicagoans have been frequenting this bar for nearly three decades and most will tell you that they have memories of late nights dancing and drinking here, alongside loyal locals, while listening to fervent bands. See a show here and be a part of Chicago history. A must-do activity in Ukrainian Village is a stop at the Ukrainian Institute of Modern Art (UIMA). Open 12-4 p.m., Wednesday through Sunday, UIMA has been the backbone of the neighborhood, dedicated to getting the community involved through education and engagement through exhibits, literary events, films and music, and gallery discussions. Members of the Chicago Cultural Alliance, UIMA promotes cultural diversity throughout the city. See works from the permanent collection as well as exhibitions viewable for a limited time. And, if you’re interested in giving back to the arts or helping the community, you can sign up to volunteer for an event. The Dark Matter Coffee company, a tried-and-true Chicago brand, has shops across the city, including a location in Ukrainian Village called Star Lounge Coffee Bar. Local art is hung on burnt-orange walls and there’s a long bar that you can belly-up to and order a Unicorn Blood blended roast. In the warmer months the patio is open, and you can bring your four-legged friend to join you in the sun. This is a great place to go to meet friends or to sit for a spell with a good book. And, if you get hungry, there are little nibbles and noshes to satiate you. According to The Theater Historical Society of America, the Chopin Theatre, an independent center for the arts, opened in 1918 as a nickelodeon. Located in Polish Triangle, a mecca for art-thick communities, Chopin Theatre today hosts over 500 theater, music, literature, film and social events per year across three stages. John Cusack, Gwendolyn Brooks and Jeremy Piven — along with many other famous alums — have all been involved with this white terra-cotta historic theater. The Chicago Architecture Center, formerly known as the Chicago Architecture Foundation, knows and loves Chicago’s neighborhoods in a way that’s palpable to anyone who attends an expert docent-led tour. CAC, founded in 1966, has designed an insightful walking tour through Ukrainian Village. 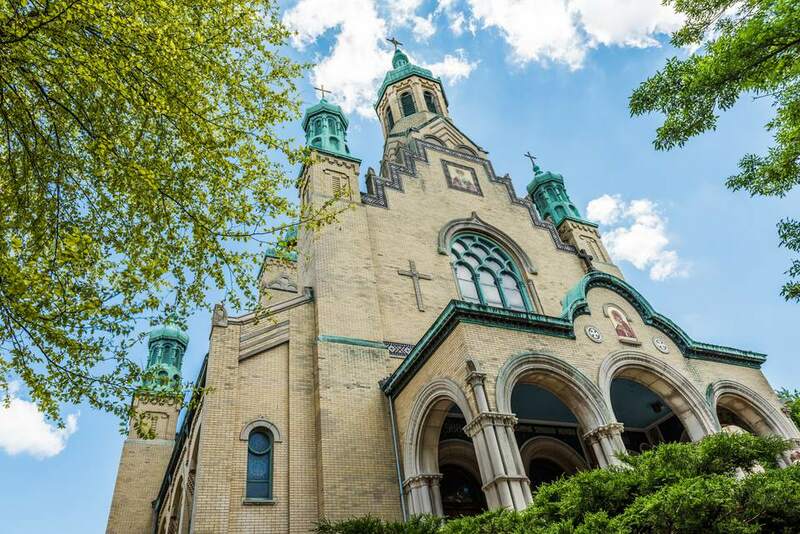 Sign up and you’ll start your two-hour tour at Holy Trinity Cathedral. Highlights of the tour include stops at several historic homes and buildings — you'll learn about how the community was shaped and nurtured by Eastern European immigrants throughout history. Each tour includes admission to the CAC. Chicago, not surprisingly, is home to a lot of graffiti and street art. Nearly every neighborhood has a pocket of urban art that allures passersby. What Vertical Gallery has done so beautifully is create an open space for national and international artists — influenced by pop culture, graphic design, illustration, and contemporary urban art — to showcase their work. Visit, peruse and take home an original piece of art. Return to see what’s new — new artists are highlighted at monthly exhibits.